Many men have tried, and failed, to woo a potential partner on the dance floor. Male guppy fish, on the other hand, have mastered the art. In their highly choreographed performance – part jig, part twerk – males shake back and forward in front of their potential partner, before contorting their bodies into a particularly acrobatic S-shaped manoeuvre. “If she’s convinced, she’ll glide toward the male and then he’ll come up behind her and fertilise her,” said Michael Bertram, a PhD student at Monash University. Except new research by Bertram and his colleagues suggests that a steroid commonly used to boost muscle growth in cattle – that ends up in waterways – may be altering this elaborate courtship behaviour. In a series of laboratory experiments, Bertram found male fish exposed to low concentrations of a chemical called trenbolone were more likely to abandon their dance moves and instead sneak up on females and mate without their consent. The group used concentrations of trenbolone, an endocrine-disrupting chemical (EDC), found in the environment. EDCs interfere with mammals’ hormone system and previous research has found they cause physiological changes to animals, such as feminising male fish. This is the first time they’ve been linked to changes in animal behaviour. Bertram said a change in mating practice that negates female choice is concerning, partly because female choice is a critical part of sexual selection, which, in turn, is a major driver of evolution. “By influencing mating success, sexual selection can profoundly affect individual populations and species, with potentially devastating long-term evolutionary and ecological impacts”, said Bertram, whose findings are published in the scientific journal Hormones and Behavior. The other consequence of “sneaking” is that it is a less efficient mating strategy in guppies. Males transfer a third less sperm during non-consensual mating, which is likely to alter their chances of successfully fathering offspring, said Bertram. Macquarie University biologist Culum Brown said plenty of research had demonstrated the feminising effect of estrogen on fish, but this was one of the few studies that had examined the effects of androgen EDCs. 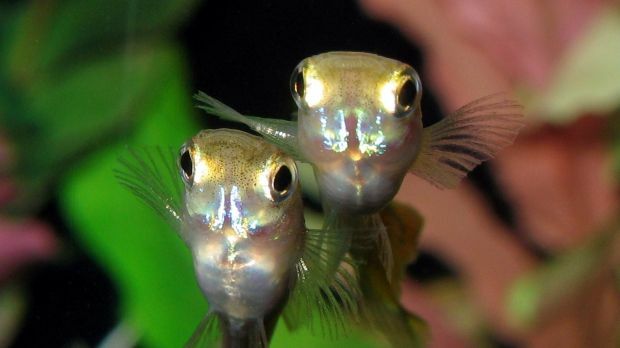 “People have been studying guppies for over 50 years. It’s fair to say we know almost everything about their mating system, which is one of the reasons they make such a good model,” said Dr Brown, who was not involved in the study. This latest research was also important because it linked these effects to low concentrations of the chemical, much lower than government authority tests, which often use death as the indicator, he said. “The current measures are far too ‘blunt’ to detect these more subtle, but nonetheless important, effects of pollution on the aquatic environment,” he said. A spokeswoman from the Australian Pesticides and Veterinary Medicines Authority (APVMA), which regulates these products, said 12 products containing trenbolone were registered in Australia. She said the APVMA and other Commonwealth and State departments regularly monitored for potential adverse impacts of trenbolone and other chemicals. This entry was posted on Wednesday, April 1st, 2015 at 11:37 am and is filed under Cattle, DRUGS, Fish, Milking cows. You can follow any responses to this entry through the RSS 2.0 feed. You can leave a response, or trackback from your own site. Created by miloIIIIVII | Log in | 80 queries. 4.901 seconds. | Entries RSS | Comments RSS.